there is one more annoyng exploit. If i give unit move order into the shroud and there is impossible area underneath, unit wont move. A* is a well known algorithm used for path finding. In this case, ronco has used it to make units move in a smarter way to the desired position of the map. could not wait to make multiplayer "work"
start synchronisation takes some time and atm. waypoints are not synchronized .. but ill get this to work soon.. next problem is that websocket needs a server that have to be startet in apache console ... we will see ..
Talking about path finding, units are being a bit dumb when you've got other friendly units in the path. You shouldn't treat them as obstacles, since they can move to allow your units to pass. I know it makes the algorithm becomes a bit more complicated, but your units will respond better when you order groups of units to move somewhere or attack something. I've noticed Harvesters can be a bit stupid and both try the same maneuver to avoid each other, thus being stuck in an endless loop. Same as they did in TD and RA1 on occasion. Basically, he remade Westwood harvester AI. Beware the bridges. So I guess we can call this one a success? Will there going to be a open-source engine which doesn't contains the graphics u were currently using but with a crappy template graphics for future wanna be? if i understand this right ..
which doesn't contains the graphics u were currently using but with a crappy template graphics for future wanna be? - i think if it is finished ill release it with this graphics i use atm. you may delete them and use your own if you want. i think its easyer to understand how it works if there is a working asset.. I'm glad to know that you will release the engine in public! Wow. I have a 64-bit computer that doesn't like C&C 1, so this is the only way I can get away from all the upgrades and support powers of C&C 3. Oh, and when I right click on a unit (or infantry/building) to stop building it, I then can't build anything from that tab PLUS whenever I right click on anything from that tab from then on, it just gives me free money. C&C runs perfectly on 64-bit systems if you install it using this installer. The original CD installer is a 16-bit program but the game itself is a 32-bit program. (*) in FF4 you will need to reactivate websockets ... type about:config to url line ... be careful and set network.websocket.override-security-block to true. i cant say how long this notebookserver stays or how many people it can handle. I don't really think that a browser game would fall under other game modding. You are not really modding but creating a new game. I like the idea and am sorry to be a buzz kill but this is technically creating a new game with copyrighted work. I really hope this game makes it far and EA doesn't send you a please stop letter. Why would EA send him a please stop letter? Have you thought about what you are saying? EA give Tiberian Dawn away for FREE, hear that?Free. This project doesn't set out to make any profit or financial gain so it's less harmful than an RA2 / Generals / CnC 3 etc etc mod. You haven't killed any buzz so no need for apologies. thats right it isnt real modding but i try to make it a moddable engine and i dont find a better place for it in this forum. ...I like the idea and am sorry to be a buzz kill but this is technically creating a new game with copyrighted work. I really hope this game makes it far and EA doesn't send you a please stop letter. thats possible but there was a post of it in official c&c forum written by EA_CIRE so i take that as some kind of "its okay"
still making goog process on multiplayer..
i thought about a root server to get multiplayer online but my finances dont allow me to spent 30-40€/month ATM. 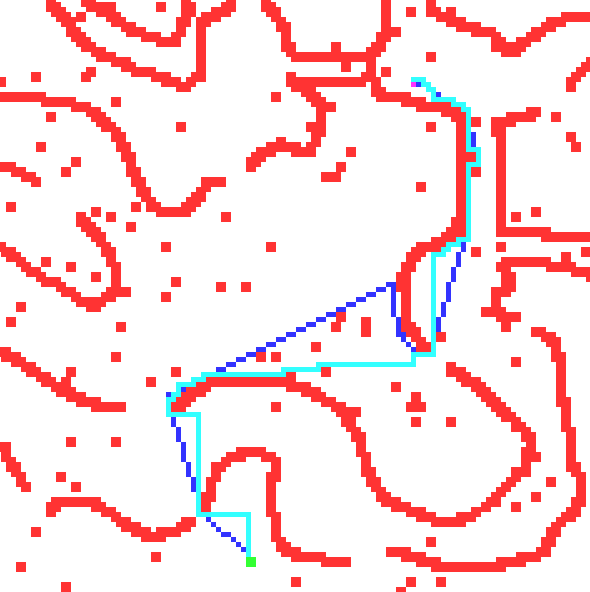 ... im on a new pathfind algorithm i made on my own ..
so my pathfind algorithm (i call it "climb" because that is what it does) returns a straiter path. i guess A* is better for meny small obstacles but mine may be better for a c&c ... i cant say witch needs less resources .. maybe i find a way to test it. Seems to have made an unnecessary move here. Dark blue ones climb, as you probably well know. Tried drawing potential cliff patterns then add noise for random objects etc, though of course in the real game there'd also be other objects moving around. now i think i got the ideal pathfind A* for cnc .. i will take the weighted one..
if you select some units it will mark the path of the other units in selected group as a littel slower. so it will choose a path arround the pathes of the other units if possible..
also i will made different tile values .. so a unit that takes tiberium damage will plan a path arround it .. if possible. and streets will be preferred .. if thay have a lower tile / higher speed value .. just like in ts and ra2. Remember that if units are too intelligent it can be very annoying. Sometimes you just want your units to go where you tell them. Yay! I would definitely help if I knew/had any interest in coding. I may try mod it though.